Today marks 26 years married to my best friend Robin. She really is my best friend and I thank God that He put her in my life. Work sucked, but only until quitting time! After work I grabbed my sweetie and took off for the evening. We stopped by the dealership to sign some papers and pick up the second set of keys and then we went to dinner. We decided on Ruth Chris Steakhouse, the food was amazing, best steak I've ever had. We talked over dinner and desert, took our time and then left in search of a daily photo. We stopped by tower bridge, then cruised around downtown for a bit before heading over to see Brandon. On the way to his place we saw an interesting display of flying colored lights just off the freeway. On the way home we stopped to check 'em out. 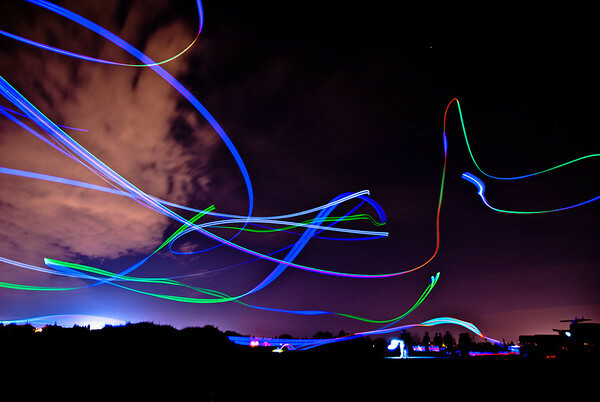 They were a bunch of folks flying model airplanes covered with colored LED's. I grabbed several long exposures and picked this one for my daily. Now I am going to enjoy the rest of the evening with my sweetie!